In today's economy, structures must remain in operation for much longer periods of time than originally anticipated. The aging effects on these structures are becoming significant and must be accounted for in the decisions made regarding usage, maintenance, and retirement of these structures. The development of nondestructive testing techniques to monitor the condition of these structures is very active and these developments are focused on extending the remaining lives and/or reducing the costs of maintenance of existing structures. A fast, accurate and cost effective method of structural monitoring that has shown to be very reliable, and can inspect both "locally" and "globally", is Acoustic Emission (AE) and Acousto-Ultrasonics (AU). AE/AU technology can detect structural defects long before possible catastrophic failures. Complementing other NDT testing methods, AE/AU has proven to be a reliable and "sound" technology for structural health monitoring within a predictive maintenance program. This is possible because discontinuities will produce detectable emissions, long before structural integrity is compromised and structural failure occurs. Acoustic Emission and Acousto-Ultrasonics technology can be applied to many of today's aging structure problems, ranging from structural health monitoring in the aerospace industry, to locating discontinuities in hybrid composite structures for active flaws. This paper will examine this technology and discuss several applications and monitoring scenarios. Acoustic Emission (AE) is elastic radiation generated by the rapid release of energy from sources within a material. These elastic waves are detected and converted to voltage signals by small piezoelectric sensors mounted to a convenient surface of the material. The sensor response and front end filters remove frequencies below about 100 kHz, which includes most audible noise. The result is that acoustic emission can be used to monitor a structure for active damage even when ambient noise levels are extremely high. Sources of acoustic emission include fracture and plastic deformation, impacts, friction, corrosive film rupture, and other processes. Acoustic emission is sensitive enough to detect newly formed crack surfaces down to a few hundred square micrometers and less. Acousto-Ultrasonics (AU) uses ultrasonic methods in a frequency range typical of acoustic emission applications. The technique is able to detect and characterize differences in the structure of single and multi-layer metallic, ceramic, and composite sheet materials. Also detection of corrosion and distributed differences in microstructure and thickness of metals and thick composites are possible. AU uses pulser and receiver transducers with resonant frequencies in the low ultrasonic range, coupled with wave propagation dynamics predictions, to detect damage. Ultrasonic waves are reflected by surfaces and interfaces, attenuated by dispersion and absorption, and undergo mode changes during reflection and transmission. These effects depend strongly on the frequency of the wave, its direction of propagation; it's initial mode and the location and orientation of surfaces and damage. When damage has occurred to a structure changes in the signal indicate the type of damage. By calculating the expected changes in the signal from given types and degrees of damage, the damage can be evaluated from AU measurements. Acoustic Emission-Helicopter Health and Usage Monitoring System (AE-HUMS) is a device for detecting damage in helicopter drivetrains. 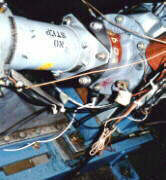 The system was developed using test data obtained from a SH-60 drivetrain (the set up is shown in Figure 1). Using this data it was shown that the AE-HUMS has the ability to detect a variety of damage processes in the various drivetrain components, can estimate relative damage severity, and can identify progressive damage such as crack growth. A growing crack in a pinion gear was detected more than fifteen minutes prior to gear failure, while the damage leading to crack initiation was detected and monitored for many hours before crack initiation, Figure 2. There is evidence that a future modification to the system will allow crack initiation and growth to be distinguished from other types of progressive damage. The AE-HUMS has potential for monitoring drivetrains, gearboxes, and rotating parts in a wide variety of applications. Fig 1: A photo of the intermediate gearbox showing one transducer (white lead, center attached to a bolt). 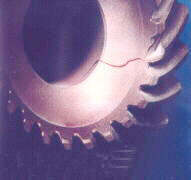 Fig 2: Photograph of the detected crack in the pinion gear. The AE-HUMS is currently configured to provide a four level damage indication. A status bar is displayed for each channel with one of four colors indicating component condition. These colors are GREEN for a no-fault condition, YELLOW for possible minor non-progressive damage, ORANGE for definite and severe non-progressive damage, and RED for severe progressive damage. No audio alarms are provided. An operator will be able to turn off any channel or the entire system. Present Non-Destructive Inspection (NDI) techniques such as ultrasonics, eddy current, and radiography require highly trained technicians, time-consuming searches of broad areas, and often significant disassembly of airframe structures in order to identify crack locations and lengths. Presently, inspection locations and intervals must be based on previous flaw statistics. A NDI scan must then be made at all locations in order to determine if indeed flaws actually exist. The use of acoustic emission allows the focusing of inspection on locations identified by the sounds of the crack growth. 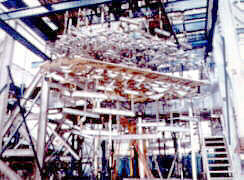 A full-scale fatigue test is based on the principle of stressing an actual production structure with load cycles similar to what would be seen in actual service. The automated loading system of the test provides a large number of loading cycles in a time period much shorter than the actual flight service. As defects are forced to grow, they are repaired as in actual operating procedures. The overall objective of this test is to determine fatigue critical locations and to define fatigue lives and crack growth characteristics at these locations. spectrum than that being currently flown by most aircraft and the expected aircraft service life was much less than being asked of our airframes today. This push to keep our older aircraft flying has led to the requirement for more and more FSFTs. 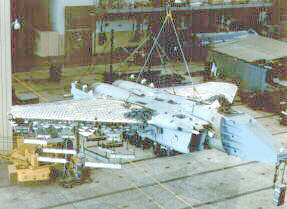 Fig 3: Photograph of a fighter aircraft being readied for a Full Scale Fatigue Test Using Acoustic Emission Monitoring. Fig 4: Typical Sensor locations on a bulkhead and wing structure. Acoustic emission testing is a technique that "listens" to structures under stress. A crack or flaw in a stressed structure will emit sound waves. These waves propagate through the structures and are collected through a matrix of piezoelectric sensors. The signals are then passed to computer based instrumentation that analyzes waveform characteristics. By comparing the arrival time of a signal at different sensors within the sensor matrix, the actual location of the flaw site can be defined. Fig 5: Typical AE indications on a Full Scale Fatigue Test. The application of acoustic emission on the F-15 fatigue test focused on several critical structures within the aircraft (see figure 4). The main points of interest were the connecting lugs between the wings and the main fuselage. These intermediate and main spar upper lugs take on tremendous forces during operation and are inspected often in the field. The wing-to-fuselage attachment lugs are integral to the wing spars and fuselage bulkheads, and are machined from 2124 aluminum alloy, 7075 aluminum alloy and 6Al-4V titanium forgings. Fatigue cracks are often difficult to locate even with the most modern of conventional inspection techniques. Acoustic Emission offers the ability to tell inspection people when and where to look. With this system you save test downtime, reduce the chance of a catastrophic failure of a test specimen, and gain a better understanding of crack initiation through the use of this system. This type of instrumentation (see figure 5) is very beneficial for fatigue studies and one day we will even see acoustic emission monitors in flight as an important monitoring system. Figure 6 and 7 show the sensor and preamplifier locations on the FST aircraft. Fig 6: Wiffle Tree, which transfers zonal actuator loads into pad loads. 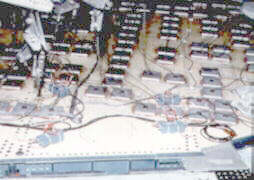 Fig 7: Acoustic Emission (AE) Sensors with preamplifiers located on a wing. has been successfully demonstrated on board the DC-XA Delta Clipper Technology Demonstrator (Figure 8) as a Structural Health Management experiment. 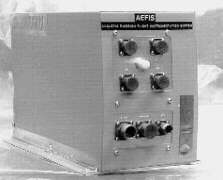 The AE system utilized was a commercially available unit that was modified for autonomous control and redesignated AEFIS, which stands for Acoustic Emission Flight Instrumentation System. Acoustic Emission (AE) technology shows much promise for meeting new requirements to monitor and feedback information to the on-board vehicle computers about the condition of the structure, fuel tanks and fuel systems. One of the biggest future concerns with space travel is micrometeorite impacts that strike the vehicle as it ascends, descends and travels on-orbit; especially since composite structures are becoming mainstream. With acoustic emission on-board a vehicle, it can passively listen to the structure and locate where the impacts occur. Once an impact has occurred, the system locates the impact and rates the severity of it. After the location is determined, the system performs an Acousto-Ultrasonic (AU) test across the impact area by actively pulsing the AE sensors and capturing the received digitized waveform for comparison to waveforms captured during calibration on the ground. The results of this test are then feed into an Artificial Intelligence (AI) algorithm to give a go/no-go command for re-entry (i.e. if the damage occurs on the ceramic heat shield; thus saving the structure from breakup from a burn-through condition). Providing a baseline of in-flight data from a rocket vehicle. 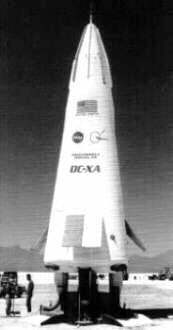 Fig 8: DC-XA Technology Demonstrator Rocket. Fig 9: Location of AEFIS and AE Sensors. 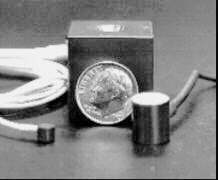 The AEFIS unit was developed over a six month period by using as many off-the-shelf products as possible. The final configuration was mounted inside the vehicle to one of the landing leg struts and was linked to the AE sensors on the LH2 tank by cables and in-line preamplifiers (Figure 9). The unit used a ruggedized industrial PC case with a back-plane CPU, (2) PAC AEDSP 32/16 AE boards, a 24VDC power supply for use with vehicle power and a solid state hard drive. The final configuration measured 6.5" x 9.5" x 15.5" and weighed ~23 pounds and incorporated no moving parts (Figure 10). The software was also derived from standard software, which allowed many choices during setup with the added features of autonomous control, self check capability, system status I/O and upload/download capability through an umbilical link. The umbilical link was used to upload new test configurations and download test data from and to a notebook computer through a panel located on the outside of the vehicle. The sensors used were also off-the-shelf products and consisted of three different types. These sensors were selected for their frequency response, size, sensitivity and their ability to withstand the harsh temperature and vibration fluctuations within the rocket during fuel loading, flight and landing. Figure 11 shows two of the three sensors and their respective size. It is evident from the work reported on here that both acoustic emission and acousto ultrasonic have a real place in the aerospace nondestructive testing and health monitoring techniques. While both of the systems reported here are only newly developed, their ability to detect cracks and delaminations in structures that have previously been very difficult or impossible to inspect, is very obvious. The work from these systems is currently being used to develop other systems that will be used on such platforms as the X-34 and Delta rockets. We would like to thank: Bruce Thompson from the Army Aviation and Missile Command AATD and Gerry Nissen and Jerry Huang of The Boeing Company for their support of the work discussed here. Helicopter drivetrain damage detection and classification using acoustic emission and a kinematic variable by Mark A. Friesel, Yuyin Ji, Wu Yan, Ronnie K. Miller, Mark Carlos.